This innovative text emphasizes how communicative processes develop, are maintained, and change throughout the life span. Topics covered include language skills, interpersonal conflict management, socialization, care-giving, and relationship development. Core chapters examine specific communication processes from infancy through childhood and adolescence into middle age and later life. *presents the implications of the life-span perspective for future research. This text is intended to be used in life-span communication courses and in interpersonal communication courses with a life-span focus, at an advanced or graduate level. It may also be used in courses on family communication, aging, and language development. It will serve as a supplemental text for courses in psychology, family studies, personal relationships, linguistics, and language studies. Contents: Preface. 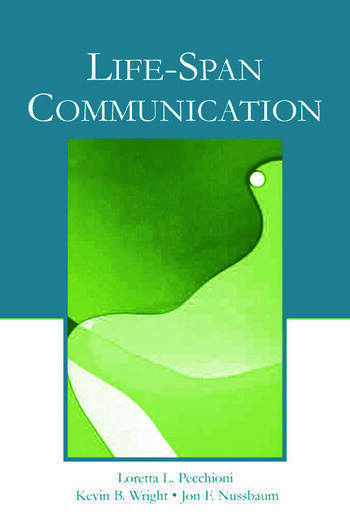 Part I: Introduction and Overview: Theoretical and Methodological Issues of Communication Across the Life Span. Life-Span Communication: Perspective and Methodology. Part II: Foundations of Communication: Cognitive Processing and Language. Cogntive Processes. Language Development. Part III: Relational Contexts. Family Communication: Childhood Through Adolescence. Family Communication in Later Life. Friendship Throughout the Life Span. Part IV: The Changing Nature of the Self and Relational Networks Across the Life Span. Social Roles and Transitions. Interpersonal Conflict Management. Social Support, Health, and Well-Being. Part V: Leisure and Media Use Throughout the Life Span. Leisure and Entertainment Across the Life Span. Mass Media and Children. Mass Media and the Elderly. Part VI: Summary: Implications of Life-Span Communication. Life-Span Communication: Implications and Issues for Research.